The group of Vishnivean refugees was divided among several deserted villages. Most of the gentile population had fled to Russia. The villages were Brestovich, Neidorf, Larokon and Vichodniza . Our family was sent to Vichodniza with six additional Vishnivean families and one family from Baron. In addition to the old timer "Yishuvnik" family, there was a total of eight Jewish families. I remember that the village consisted of a very long street. It was surrounded by meadows and a large forest. A stork was nesting on a pillar. A mule was ploughing the field harnessed to a wooden plough, while the sun was peeping through the clouds. My family consisted of my father, mother, my three sisters and me.. My brothers Leibl and Yaacov-Hirsh Hirsh were not there. As I told you, Leibl was forcibly drafted into the "Panni Battalion", and Yaacov-Hirsh was a POW in Germany. Chaimke the "Politzman" came to show us what kind of housing we are getting. Mother followed him saying ,"Chaimke, Gib Mir A Kleininke Dire Un Shchenim". (Chaimke, I prefer getting a smaller apartment, but to be without neighbors). In Olshani she was tired of sharing a single house with many families. "Chaimke, A Kleininke Shtibele, Nor Alein" (Chaimke, a smaller house, but alone). The house that we got was really tiny, so Father used to make fun of her by reminding her: "A kleininke Shtibele, Nor Alein". The house was in the village center. It contained only a bedroom and a kitchen. The floor was covered with sand (later we added wood and sacks). The kitchen had two ovens: one for cooking (Plite) and one for baking. In the winter it was terribly cold in the house. The toilet was outside. Water was pumped by hand from the well. My sister Rivka was a "Baleboste" (excellent homekeeper). She helped Mother in cooking and cleaning. She used to brush and shine every piece of glass, window and copper houseware. When she cleaned the floor, nobody was allowed into the house until everything was ready. She was the most industrious among the four sisters. Because of her, the house was extremely clean in spite of all the limitations. My other sisters helped too in the fields and in the house, but she was outstanding. This is how the story happened. The estate of the Graf was located at the outskirts of the village. In the time of the war, the German army used it as its headquarters. When we arrived in Vichodnitza we were amazed to see a large field of potatoes surrounding the estate. People were freely collecting the potatoes. Mother too collected potatoes and cooked them in salty water. She was happy that there was a source of food. To her dismay, as soon as we finished eating everybody felt heavy and drunk with headaches and vomiting. What was the reason? The field had two types of potatoes: to the right there were edible potatoes, and to the left potatoes for making spirits. When the Germans came to see what happened to us, they said that the potatoes we ate were good for making spirits, bread and "Latkes". They did not mind at all that we collected the potatoes as there were plenty to go around. After two years in forced labor, Leibl arrived at Vichodnitza. He told us that his officer liked him and gave him an "Orlov" (vacation, in German). You can imagine our joy. He decided to stay with us and did not return to his unit. The officer who came to pick him up was bribed by our family and Leibl stayed home. It was wonderful that he stayed with us, but I think that for his own life it was not the right decision. The forest was 20 meters from the house. It had "Lisitzes" (mushrooms tasting like meat), "Yagdes" (blackberries), "Pozimkes" and "Broshnikes" (other types of forest berries). We lived for four years eating forest fruit. Those were four years of not eating meat. But at least we had what to eat. I, the smallest in our household, was "dragging" behind my older brother and sisters to pick the fruit. They used to disappear behind the tall trees because they really did not want me there. One time when they disappeared, I began shouting as usual "Rivka HoHaHaHaHaHo", "Gitke, HoHaHo..", "Rachel-Lea HoHoHo", "Leibl….." of course nobody answered, except the echo. Suddenly I met the forest keeper.. "What are you doing here, girl?" he asked. "I am picking blackberries" I answered. "It's forbidden. It belongs to the government," he said. "Government? What's for me government? This belongs to God!" I answered. The forest keeper then met the Jewish "Yishuvnik" and told him that "In the village there is a girl who isn't afraid of anybody except God." He told this as an anecdote, but the truth was that one needed permission to pick fruit in the forest. Anyway I collected "Yagdes" and brought them home. I did not tell anyone about my encounter with the forest keeper. Father learned about it when he went to pray Arvit at the "Yishuvnik". I had all the characteristics of the youngest daughter. I would imitate like "a monkey after a human being" anything that grown ups would do. When everybody picked up potatoes - so did I. I got a little basket and picked up potatoes. 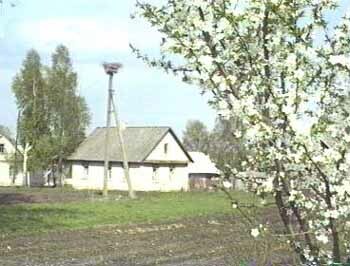 In the winter there were wild cherries growing everywhere in the village. My brother and sisters would go around filling sacks. Mother would store them in the "Boydem" (attic) till they softened. Then she would put them in the oven. They were tasty. We would also pick wild apples. We would store them in the space between the double windows and this was good. The Synagogue and Our "Yishuvnik"
On the first day of our arrival at the entrance to Vichodnitza, a sixteen year old boy stood and asked his father, "Tate, Vos Shlepn Do Yidn?" (Father, why are Jews coming here?). This was Shloymele, son of the "Yishuvnik" who lived here for many years. Shloymele's brother was David. David was a socialist. He worked in Bialistok and fought for this new idea (socialism). The "Yishuvnik" had fields, cows, a house, and most important - a Torah. For the first year Mother, Father and the other Vishniveans would walk 6 km to the Shtetl Rosh synagogue to pray and be among Jews. This was not convenient both for the Jews in Rosh who felt too crowded and for the Vishniveans. 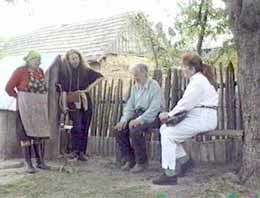 Finally they decided to stay in the village and pray at the "Yishuvnik". He was a "Shmid" (blacksmith) and disabled. He had a wooden leg below his knee. His wife was a weak woman. His house served as a small synagogue for the daily "Minyan". We even celebrated Rosh Hashana and Yom Kippur together in the village. On those days we would go together to hear the prayers, the Shofar and "Kol Nidrei". When Leibl arrived, he joined the daily "Minyan" and the reading of the Torah. We kids went to synagogue only on holidays. We did not know how to pray. We did not have any schooling during the war and we did not know how to read or write. All the children would gather in our yard. This included gentile kids under twelve year old. At age twelve the "Sheigetzs" would become "Pastechers" (shepherds) "Un Nisht Gedarf Hobn Kein Tzatzkes" (and would not need toys anymore). Near us there was a vacant house, without windows, door and roof. We would gather there bottles and other junk. We would fill the bottles with "milk" made of the lime soil found in this area. In order to make dolls, we used to fill torn socks with rags for the doll heads and add some old cloth for the doll bodies. Two older neighbor girls used to play with sheep bones for the "Five Stones Game" which you know from your own childhood. We also played "Hide and Sick" and you can imagine that there were many places to hide. Mother taught me how to knit socks. There were no needles and no knitting needles. What did I do? I found an iron wire and Mother helped me cut it into five knitting needles. That way I learned how to knit socks. I used to spend hours undoing the stitches of old woolen stockings and sweaters and then knitting. In a similar way I prepared a needle and began sewing dolls. After a while they got a real needle for me from one of the village neighbors. I used to fix socks with five knitting needles. Only threads were missing. I remember having a little bit of wool. Since I loved cats I knitted socks and clothing for my cat, and then sent it into the snow to see how she "enjoyed" the new dress. Mother and my sisters came out with me and "enjoyed" my innovative ideas. My sisters did not want to knit. I was the most talented. On the first day that we arrived at the village, the few gentile neighbors who remained there brought us "Kashe Kartofl On Geshlogene Ayer Mit Chazir" (mashed potatoes with a pork omlette). The grown-ups did not eat the pork. However Father said that "the kids are permitted to eat after a week on the road without food". The villagers were simple people with good hearts. All of us had nothing. They always radiated warmth. When we came there we did not know how to talk "Goyish" (Belarussian language). What did our neighbor kids do? They put out pots, a table, a chair, etc. Then they pointed at them and said in their language: this is a chair, and this is a table, pot, flower, and we repeated it after them. That's how we learned the language after a while. I was very curious and learned very quickly.